Everyone is positively giddy about the new offerings of the new tablets and e-Readers being rolled out, like Amazon’s new Kindle Fire Android operated tablet PC. There is also significant buzz over the Kobo Vox and Barnes & Noble’s Nook Tablets as well. All of these models are now shipping or close to shipping for mass consumption. The appeal is mutual as these Google Android mobile devices allows the consumer to have Web based functionality at a much more affordable price than the higher end tablets on the market. There’s also a lot of attention being focused towards the even more affordable “stocking stuffer” priced devices such as the smaller E-Ink e-readers. The only difference being they don’t offer web browsing capabilities, but the lower price point of around $100 is attractive and is an excellent alternate. All three of these vendors are targeting this market segment, either by strategically dropping their prices, or by introducing improved better performing tweaked versions of their previous devices. Amazon offers a couple lower end e-readers, starting with the basic Amazon Kindle. The price is extremely attractive at around $80, but it comes with advertisements which Amazon calls “Special Offers.” They appear directly on the screensaver as well as near the bottom of the home screen. If you’re not interested in giving someone a Kindle which constantly pushes these ads on them, then there’s the “ad-free” ereader device for $30 more. The Kindle is a Wi-Fi ereader which weighs around 6 oz, with an E-Ink 6in. display. The device is equipped with 2GB of storage for ebooks along with free cloud storage to store your Amazon content. The 2GB may not appear to be that much storage, but they’re designed to strictly store small footprint ebooks. If you’re looking for more space, then the Kindle Fire Tablet PC, which also offers full-fledged Web browsing is what you may be looking for. Amazon also has what they call an “experimental browser,” where previously, the browsers which was on the Kindle were pretty basic. So this new browser should be an upgrade. This newer Amazon ereader model is the Kindle Touch. The Wi-Fi only version is offered for approximately $20 more than the basic Kindle, where the 3G version sells for around $150. The non ad model sells for $30 more. Similar to the basic Kindle, the dimensions are similar. The advantage of this upgraded model is the storage. The Touch Kindle has 4GB of storage along with better battery life according to Amazon. So what may be a bit of a pricing error is that the Kindle Touch or the Keyboard e-readers are close in price with the new Kindle Fire Tablet PC, which is at $199. Barnes & Noble currently offers one E-Ink reader, which is the Nook Simple Touch. The price is set at $99, and unlike the Amazon, has no advertising. The Simple Touch, similar to the basic Kindle Touch, offers a 6-in. display and 2GB of storage with around 1GB for actual ebook storage. The device also includes a microSD slot for additional storage. The Nook Simple Touch is strictly a Wi-Fi device. Barnes & Noble offers free Wi-Fi connection when in their stores for the downloading of their ebooks, as well as from various AT&T hotspots. Barnes & Noble has also dropped the price of its original Nook Color ereader, which is the first color e-reader to be made available. The Nook Color eReader is offered at $200, while their Nook Tablet PC is priced at $245. The Kobo Touch is almost lost among the ereader marketplace dominated by Amazon and Barnes & Noble. The Kobo Touch also has a similar 6-in. display along with 2GB of storage with a microSD slot. The Kobo Touch was originally priced at $130 in its efforts to keep within the same price range of its competitors. Kobo also recently announced a price drop down to $99, which is supplied with ads on the screensaver, similar to the Amazon Kindle. What the lower cost prices of these ereaders complies to is the “Computer Printer” theory of economics. If the Printers are sold at extremely low prices, or even at times they’re even given away, the printer manufactures can then make their profit back by the selling of the consumables, which in this case would be the printer toner and ink. When the e-readers first began to appear, these vendors didn’t seem to adopt this theory. But recently with the under-$100 e-readers, it now appears like they have. They have all reduced the prices down to where it almost becomes an impulse buy, and could easily be considering a suitable “stocking stuffer” gift. 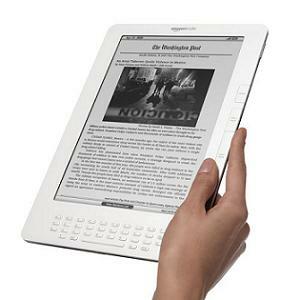 All these ereader vendors are able to make their profits on the consumables, which is the selling of the ebooks. So Amazon has decided to offer their fully functional tablet PC, the Kindle Fire for approximately $200 less than what the iPad is selling for. Although the newer color e-readers offer limited features, such as no Web browsing or the use of apps, their general usability can still be an excellent alternative. It will be interesting to see if the prices for the eReaders will continue to drop. The popularity of these e-readers has proven that there is a market for them as there’s a huge amount of people who enjoy reading ebooks, and are thus willing to purchase these ereaders, primarily because of convenience. If these vendors continue to profit from the selling of the ebooks, and the volume of sales become high enough, then perhaps it’s possible that we’ll one day see the prices for these e-book readers to be as low as the cost of a paperback, or even be given away for free.